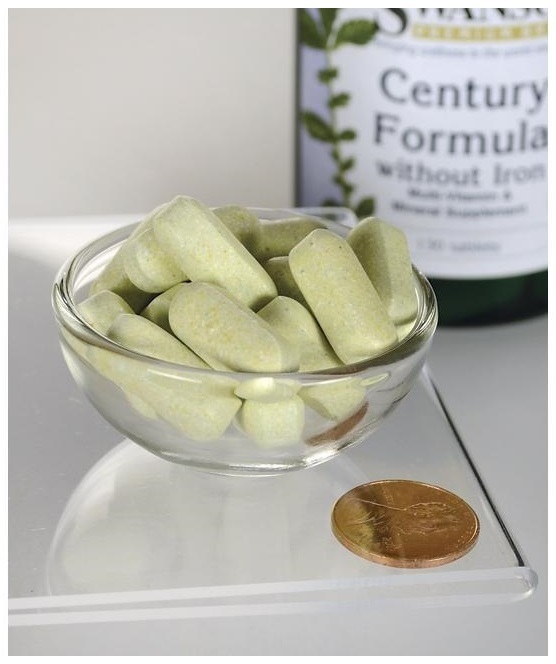 Swanson Century Formula Multivitamin without Iron delivers a full day’s supply of 15 essential vitamins and minerals, including the entire B-complex, in one convenient tablet. It’s a great way to cover your nutritional bases every day. Other ingredients: Microcrystalline cellulose (plant fiber), stearic acid, croscarmellose sodium, magnesium stearate, aqueous film-coating (purified water, hydroxypropyl methylcellulose, polyethylene glycol), acacia, maltodextrin. Suggested Use: As a dietary supplement, take one tablet per day with food and water. Women who are pregnant or likely to become pregnant should not exceed recommended dosage. WARNING: Contains vitamin K. Consult your healthcare provider before use if you are taking blood-thinning medications or are pregnant or nursing.